Many would be entrepreneurs hesitate to start their own business because they think it is too risky from a monetary perspective. In fact, most people don’t think starting a business is even worth trying unless they can come up with a grand slam profitable idea. Of course profitability is an extremely important factor with any business, but what if I were to tell you that you could save a decent amount of money every year with your business while only making a small profit or none at all? That’s right! Most people don’t consider the tax savings involved in running a business. Most people don’t realize that having a day job is one of the worst ways to save on taxes because Uncle Sam takes a huge chunk out of your paycheck BEFORE you pay for anything. On the other hand with a business, you can effectively pay for everything using pre-tax dollars which can save you up to 35%. So while on paper your business may not be making any money, in reality you could be saving big bucks by purchasing goods with money that is not taxed at all. But talk is cheap! I thought that it would be interesting to throw some numbers into the mix by calculating how much the average American could save by starting their own business. First off, the average American makes roughly $63,091 before taxes (Click here to get updated incomes in the US). If we assume that they fall under the 25% tax bracket, the average American is also getting reamed up the wazoo by Uncle Sam to the tune of about $11960 before they can even use this money leaving themselves with only $51131. Even worse, the average American spends roughly $49638 a year which doesn’t leave much savings. It’s no wonder that the average American household is just barely scraping by! 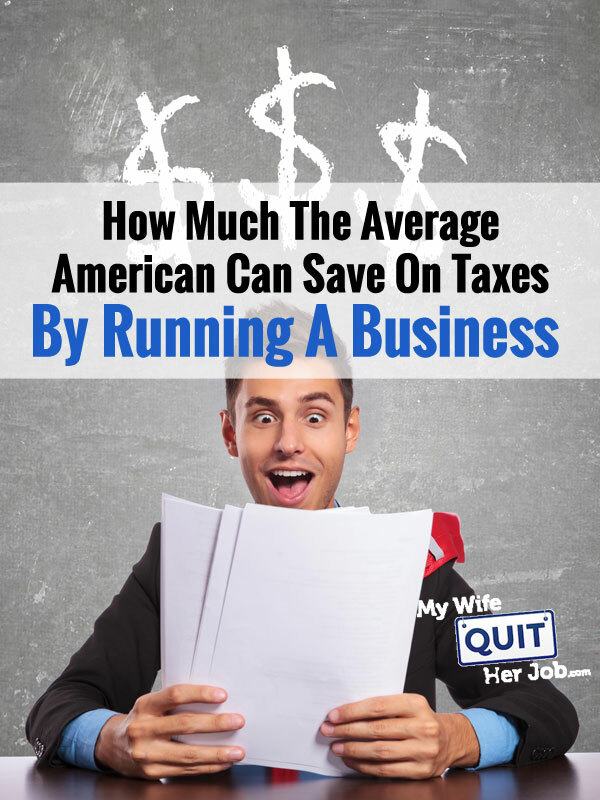 In order to calculate the tax savings associated with running a business, we must break down each and every expense of the average American to see what can possibly be written off with a business and assume a certain percentage of savings. Below is my analysis. The average American spends roughly $2384 on gasoline and oil related products. If we assume that gas is $3 a gallon and that the average car gets 20 miles per gallon, the average American drives roughly 15893 miles per year. We’ll round this number to 16000 for simplicity. Currently with my business, I’m able to expense roughly 22% of the miles I drive on my car for business purposes. How do I do this? Whenever I need to drive some place or run some errands, I make sure that I try to take care of something business related along the way. For example, if I need to go to the grocery store, I also make a trip to the office store or other related establishment where I need to pick up something for the business. It takes a bit of planning and excellent documentation but you’d be surprised by how easily you can find ways to use your car for business. For the average American, 22% of 16000 miles is roughly 3520 miles. For 2009, the IRS mileage tax deduction is 55 cents. 3520 * $.55 equals a tax writeoff of $1936. The average American spends $10,023 on housing or shelter every year. Currently, my wife and I expense 20% of our rent for business related purposes. In actuality, we use more than 20% of dedicated business space in our home but we keep things at 20% to prevent the likelihood of an audit. In any case, 20% of $10023 equals $2004.60 of tax writeoffs for the average American. The average American spends roughly $2668 a year eating out. For my wife and I, we love discussing business over dinner. In fact, we make many of our key business decisions at restaurants because it’s a more relaxed environment and easier for us to concentrate. As a result, we are able to expense some of our meals every month. For this analysis, let’s assume that the average American can expense 10% of their meals. Because meals and entertainment can only be deducted at 50%, this effectively equals a 5% writeoff. $2668 * .05 equals $133.40. The average American spends roughly $1600 on summer vacations every year. While travel expenses purely for pleasure can not be expensed, any vacation can be made to be business related with the proper planning. So what my wife and I usually do every year is plan our vacations around our business travel. For example, a few years ago my wife and I had to meet with linen and textile vendors in Japan so we made a vacation out of it. We purposely planned our meetings every other day and used our free days to relax and pamper ourselves. If you do things right, you can pretty much expense almost the entire vacation! Because I’m not sure how the $1600 a year is broken down in terms of airfare vs food/entertainment costs, I’m going to assume that 75% of this cost is deductible for the average American. Total tax deduction $1200. Since we use 20% of our house for business, it’s only fair that we deduct the same percentage for utilities. In addition to water, gas and electricity, we also have a dedicated phone line for the business which can all be expensed. The average American spends $3477 on utilities every year. Once again, the exact breakdown of this number is unclear so we need to make some assumptions. For example, a business probably wouldn’t be able to expense the cable tv bill. However, most other items are fair game. To be conservative, I’m going to assume that at least 10% of this amount is deductible which puts the deduction at $347.70. Unfortunately, this category is extremely vague. Computer equipment and household furnishings covers everything from furniture all the way to decorative items and computers but excludes major appliances. Because this category is so broad, I’m going to be conservative here and assume only 15% of this amount is deductible. Thanks to section 179, computer equipment and other furnishings can be expensed 100% up to a six figure dollar amount every year. Chances are, if you have a business and purchase a computer, it can be written off in its entirety in the same tax year. The average American spends $1797 in this category. 15% of $1797 is $269.55. Obviously, I have not included every possible business expense in my analysis, only the common items. If you really want to get nit picky, in reality you could probably expense far more than what I’ve mentioned in this article. In any case, if we total all of the categories mentioned above, this comes out to $1936 + $2004.60 + $133.40 + $1200 + $347.70 + $269.55 = $5891.25. Based on an income of $63091, this represents almost a 10% writeoff on the average American’s taxes! Putting all of the numbers together at a 25% tax bracket, this is a savings of $1472.81 every year. Keep in mind that most of the deductions I calculated above were on the conservative side. In practice, my wife and I actually deduct a good amount more especially under the computer and equipment category. If you are worried about getting audited, the best thing to do is to arm yourself with an accountant and document every expense carefully. Your accountant should be able to tell you with high confidence whether or not an expense is actually deductible. This is free money folks, but only available if you have a business. Stop giving your money away to the government now! Disclaimer: As one reader pointed out, this article is not meant to encourage people to haphazardly make tax deductions for their business. In fact, I discuss the flip side in depth in my article on Is Your Business Just A Hobby In The Eyes Of The IRS. However that being said, the deductions mentioned in this article are not exaggerated. In fact, I believe that the majority of people don’t take tax deductions that are rightfully theirs because they are afraid of the IRS. Talk to your accountant! They will know how to help you figure out how to make the most out of your deductions. Here in Italy employees don’t directly pay taxes, but instead employers are responsible for paying them. As a results employees have a very low paycheck because they can’t save in taxes in any way. This is a great summary of many of the tax benefits of a business but keep in mind you still have to make the home business and be generating income in order to truly make these write offs. What’s nice, is even if you only make $6K, if you can write off $6K you pay no income tax on that earnings and so the savings you made really are your profit. I do personally think some of your write offs are exaggerated and not something you should encourage people to write off, such as vacations due to business meetings. Most of the rules that do exist for things like that and even for local vehicle use are pretty strict that it must be things strictly for your business or the time / distance traveled but be split % wise to consider the allowable claim. So, if you have 10 days of vacation and only 4 hours in meetings, you can only claim a VERY small portion of the trip costs. Otherwise, you are asking for trouble if (or when) you do get audited. I’d advise to be careful of your accountant as well, they make a recommendation, but if you are still ultimately responsible for what you claim, not them. I agree with what you are saying for the most part. Business travel is one of those areas in which if you use your common sense you should be okay. Of course, in the scenario you presented, the vacation would obviously not be deductible in its entirety. That being said, the bulk cost of any trip or vacation lies with the airfare and the lodging and there are a few rules that I didn’t cover in this article. 1. If you are traveling for a trade show, there’s no problem in expensing everything as long as it’s within the duration of the show. 2. The trip has to have a clear business purpose and trip’s primary purpose must be business. 3. Weekend stay overs are deductible if you fly. That being said, the little nugget that I probably should have elaborated on was that my trip occurred during trade show time. My wife and I went for the trade show and decided to make a vacation out of it. In any case, details aside, taking tax deductions is one of those things that requires common sense. It all depends on your risk threshold. Your accountant should help you out in that respect. God I love that photo! I think it is a great summary of some of the tax benefits of owning a business. In fact, there are probably many more available depending on your circumstance and your business. Mike King, you are correct that there are many regulations to be wary of and many hurdles to clear but, in the case of the vacation, if the travel is for a business purpose and a few days of vacation are tacked on, you can definitely deduct the cost of the travel. It always pays to do your research and plan ahead; or pay someone else to do it for you! I make my money as a freelance writer. I could write off many of the same things that you, it seems. What I am wondering is this–I am not registered as a business. I simply write under my own name and my social. I know that I don’t get the tax-free benefits of having an EIN, but I’m not so worried about that. Do you think I’ll be able to write things off in the same way, or should I license myself as a business? Thanks for an article that covered just what I was needing to know, as I have only been freelancing full-time for three months. It doesn’t matter whether you have a FEIN or are using your own social, you can still take tax deductions as long as it is a part of your business. The best way to do it is to establish completely different bank accounts and keep separate books for your personal and professional expenses. Of course, if you are going to do that, you may as well get yourself an EIN. It literally takes a few minutes to do it online. That’s true. Income taxes from a job are taxed at the highest rates. And, having a business is the best way to reduce taxes. It is pretty strange that there are people who don’t have their own business, when it is the most powerful way to reduce taxes. Are you sure about your income statistics? I think the average American makes about $30,000. The best book I have found about taxes is Lower Your Taxes – Big Time! by Botkin. Definitely worth getting. In the book I found strategies that my tax guy didn’t know about. Also, it is important to have a great tax preparer help us make the most of our situation. Your personal income tax information is incorrect and misleading. With progressive tax brackets you don’t pay 28% on all your income. Only the income within the bracket. A single filer making 63k a year owes about 12k in federal income tax for an effective tax rate of around 19%. Thanks for catching that. I have made the changes to the article accordingly. That being said, the overall tax savings is not affected by this number. The tax bracket range in question is 33950 – 82250 so any deduction will save you the full percentage of all deductions at the top of your tax bracket as long as it doesn’t take your income below 33950. The one major mistake which I just caught is that the tax bracket is actually 25% which I wrote down as 28% from memory. I’m updating the calculations now. Still significant savings regardless. I have a question?? Whats my time worth?? I built my own website which took several hours, I read how to books, I attended webinars, I do regular maintenance on my sites and blogs. I am sure I can write these off but at what rate? I’m thinking of building a shed/workshop in my backyard that would eventually be the home of my business. This structure is taxable by my town. My question is, would I be able to write off the structure and the increase to my taxes as a business expense? I’ve seen similar businesses that operate out of an attached garage, etc. So, for the portion of these expenses you are not able to deduct, do you pay them with your personal bank account? Or it just goes toward reducing your profit in your business account? Thank you, I am trying to understand correctly. This is some awesome info! especially for people wanting to save on taxes.